This past Thursday, I, along with ten other representatives from local school districts, met with State Senator Ken La Valle to follow up on a meeting we’d had with him just before the budget vote. The following is a recap/commentary on that meeting. We started the meeting very directly. We asked the Senator why, just three days after telling us he opposed tying teacher evaluations to test scores, did he vote for a budget that not only increased the role of test scores, but contained many other provisions that were damaging to public schools? His response was basically that he and his fellow Senators had no choice, as rejecting the budget would lead to a shutdown of the State Government, so he was obligated to vote yes. We countered that it was the responsibility of the legislature to put forth the budget they feel is right, regardless, and that a late budget (which yes, could entail a shutdown) was better than a bad budget. But the Senator implied that a shutdown was off the table. Essentially, what he was saying was that the Governor forced the legislature to do something against their will, by threat of extreme financial hardship. This is, literally, the definition of extortion, but when we said as much, Senator La Valle was adamant that he didn’t use that word and seemed bothered by such a harsh description of events. This is significant because if the Senate was not extorted into passing this budget, then the rationale for his yes vote doesn’t hold water. 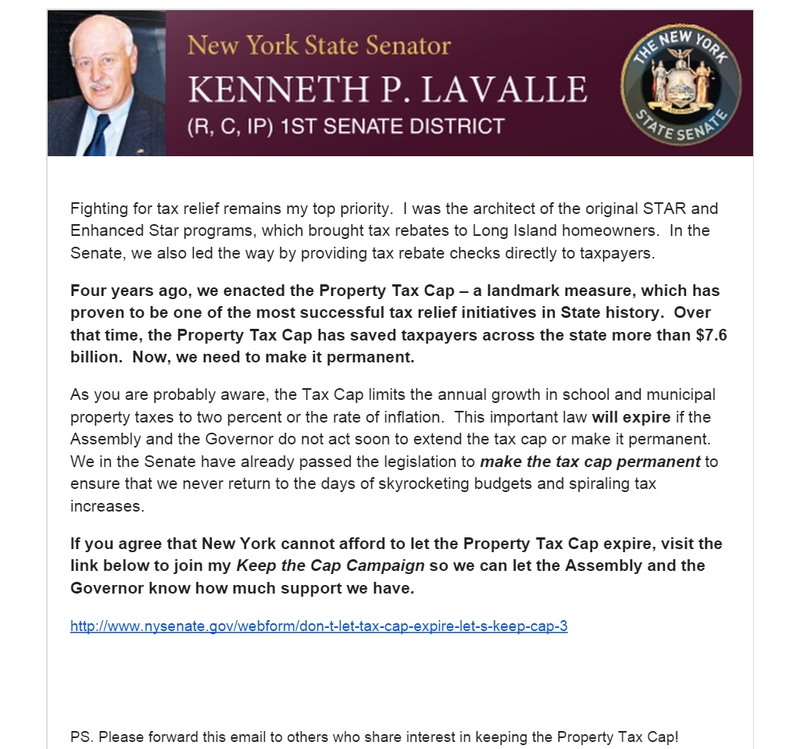 But if it was extortion, then the legislature has an obligation to work to undo the damage now that the threat is over and the budget is in place – not to just concede defeat and move on. Senator La Valle did agree that things need to be fixed, and he talked about a two-prong approach, the first of which would be in place by June and the second to come later. Unfortunately, this first prong refers to the almost meaningless (and possibly damaging) Flanagan bill. When we pushed back and told him we don’t support that bill as it doesn’t fix anything, he backed away from it and pointed out that he was not a sponsor of it. He provided no details on what the second prong would look like (or when it would be implemented), but there doesn’t seem to be much reason to expect it to be anything significant. So where does this leave us? Senator La Valle insists that he supports us and is on our side. He reminded us of his push for the Truth in Testing Bill. He has been a friend in the past and we take him on his word when he tells us that he argues for public education within his conference. Also, the fact that he makes time to see us, when some of his colleagues do not, says a lot. But being on our side in spirit but not in action is of little value. In general, it seems wrong to take the “what have you done for me lately?” approach, but if what you’ve done lately seems like a stab in the back, maybe the question is a valid one. Someone raised the issue of how the Senator might be perceived when we report back on the meeting. To his credit, he said he wasn’t terribly concerned about that, as he felt his constituents would form their judgments of him based on what he accomplishes. We could not agree more; that is precisely how he should be viewed. But what we need to see from the Senator is not tepid support for vague half measures and the promise of future fixes, but bold and aggressive moves that help protect kids, teachers, and public education as a whole. “Truth in Testing” is good, but it just one small piece of the picture. If, and only if, we see this happening can he have any reasonable expectation that all of the people who’ve vowed never to vote for him again will reconsider. The Board of Regents held their “Learning Summit” on Thursday to gather feedback on revised regulations for the APPR plan. As Perdido Street School Blog wrote, it didn’t exactly go as planned. What was supposed to be a forum for generating ideas for moving forward turned into a total beat down on the plan as various constituencies (teachers, superintendents, BOE members, etc) took turns tearing apart the new education law. For more information, you can click here for NYUST’s take on the event or read this article from WNYC. But if you only have time to read one report, see below for a first person account from SWR parent and Comsewogue teacher Melissa McMullan. Also, if you haven’t sent your comments to eval2015@nysed.gov yet, please do so (see this page for tips on what to write). Ken Wagner says they’ve received thousands of responses. Let’s make sure they receive thousands more.